In this brief article, we'll consider a simple method to factorize a number into its prime factors. We'll use Small Basic for our means, which can be downloaded at http://smallbasic.com/. Once installed, we will be ready to go. Before we begin developing our solution, it could be useful to spend some preliminary words about what we will implement, i.e. what factorization is, and why we could/should care about it. Factorization, in mathematical language, is the process through which we take an object (like a number, a polynomial, etc.) and decompose it to a product of subparts, that will form our original object when multiplied. The factorization of integer numbers is a complex problem because it is difficult to complete it in reasonable times, when the given number is very large. In widely known security algorithms, such as RSA, that computational complexity is what the algorithm is primarily about: in fact, the public key a user can create with RSA is based upon two prime numbers (which must remain secret), and breaking a RSA key ultimately means to be able to factorize it. For an explanation about that topic, you could refer to Integer factorization and RSA problem. Integer factorization resides on the fundamental theorem of arithmetic. An integer number can be defined prime when its only divisors are 1 and the number itself. If that condition isn't satisfied, what we have it's what's called a composite number. Prime numbers have various applications outside the field of pure mathematics, a good example of which we've seen above, speaking about cryptography. The fundamental theorem of arithmetic states that every integer number greater than 1 its either prime itself, or is the product of prime numbers, and that this product is unique. For example, the number 2500 is the product of 2 * 2 * 5 * 5 * 5 * 5 (or 2^2 * 5^4), while 31 is prime itself. To check for primality, the first thing that comes up to mind is to test a number against all its predecessor, to find out if it's divisible only for itself and 1. If that kind of approach can be pretty straightforward in case of relatively small numbers, think about what will happen in case we want to check a number with many thousands of digit. Leaving alone all the discussions and algorithms mathematics have produced to simplify the problem, a general rule tell us to check only the divisors up to Sqrt(n). The reason for that is simple: if a number n is not a prime, it can be factored as a product of p * q. If those factors are greater than the square root of n, that means the product p * q will be greater than n too. One of the two factor (at least) must be then smaller than the square root of n, so we need to test only factors which are smaller or equal to the square root. Lets see how we can implement such a flow with Small Basic. As we've preiously stated, we need to ask the user what is the number to factorize. At the same time, we need to initialize some other variables we'll use in our program. Pretty self-explanatory: we test our current divisor against all its possibile divisors up to the square root of itself. The isPrime variable will store the result of our test. Now we want to show to the user our factorization expression. To mantain a concise representation of our result, i've chose to write it as a product of powers (like the 2^2 * 5^4 seen above). Lets see how. For every element stored in our factors array, we check if its predecessor has the same value. In case the test is positive, we increase a variable named power, which will represent the power of the number itself. 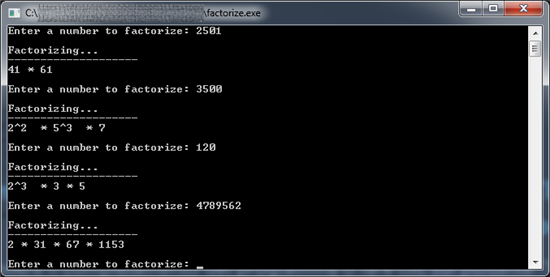 When the current factor is different from the previous, we could write it in the output console, with its power as well.